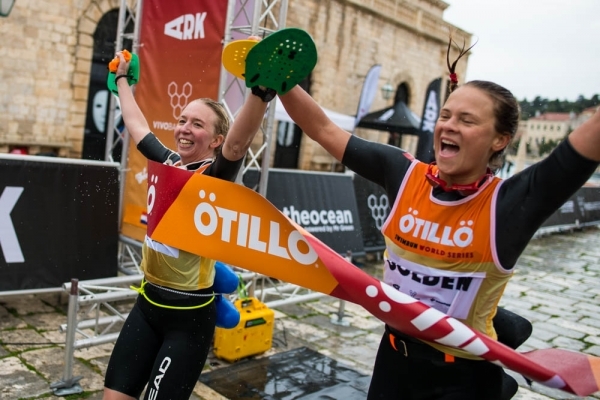 The 2019 ÖTILLÖ swimrun season kicked off with a very tough race. It ended up being a hard fought battle for the 3rd edition ÖTILLÖ Swimrun World Series event on the island of Hvar, Croatia. The Mediterranean setting had all the ingredients to make for a spectacular yet very tough swimrun race. The original 40,4 kilometres long course had to be changed as the currents made it to a true test, alternating technical trail running with long, challenging stretches of open-water swimming. The Winners Jonas Ekman Fischer and Lars Ekman (SWE), Sailfish Team Bröderna Bäver, managed to pull away from the leading pack and cross the finish line as the first team after 4:51:51, almost 7 minutes ahead of Julien Pousson and Nicolas Remires (FRA), Team Envol. The very strong Martin Flinta (SWE) & Helena Karaskova Erbenova (CZE) Team Thule Crew/Wolffwear Head SR team finished as first mixed team and 6th overall with the time of 5:01:50! The first women’s team Fanny Danckwardt & Desirée Andersson (SWE) Team Envol Fanny/Desirée completed an impressive race and finished after 5:24:12 and 10th Overall. The island of Hvar, part of the Croatian Dalmatian islands, is considered one of the 10 most beautiful islands in the world. With its rich cultural and historic heritage, ancient olive trees and vineyards, crystal clear waters, limestone rock and varied terrain, surrounded by the fabulous Pakleni islands, Hvar is the perfect destination for a ÖTILLÖ swimrun race. There is no doubt that Hvar lives up to ÖTILLÖ's claim of having unique races in unique places!